A Crimson Kiss – Timeless Events and Classic Cocktails: and Confection! So many brides are inspired by their dresses, and as I've poured over this season's collections, I can't help but think of the type of wedding each gown might inspire. 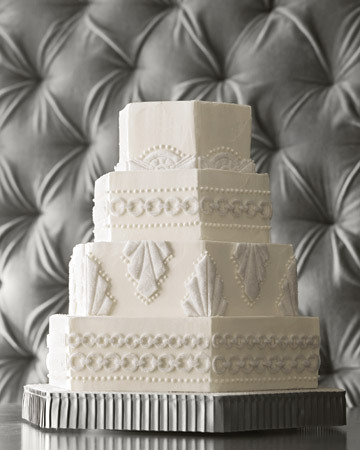 I imagine that the bride wearing Jenny Packham's slinky, art deco design would chose a cake with similar motifs; Martha Stewart Weddings featured this gorgeous cake, decorated with buttercream pearls and fondant plaques coated in sanding sugar. Do you think your dress will inspire other design elements, or was your gown part of a larger vision for your big day? It's too beautiful to eat. I would keep it in my living room. My gown inspired the other colors in my wedding as well as my cake. It's amazing how those things fall into place. I haven't had my big day yet... sigh.... but I'm still keeping my fingers crossed that he's out there! I hope my gown will set the tone for the whole shibang! Nothing like a pretty white dress with some yummy white cake! what an absolute stunner!! my dress + cake selection had very little to do with each other - i picked what i liked and hoped it all flowed together somehow in the end! did you say fondant? i wish i could eat this for lunch, nevermind at the wedding! That cake looks too good to cut and eat! My wedding is a long way off, but I think my gown and cake will all be small elements of the bigger picture! My gown was definitely an expression of my style and so was my cake. Timeless, clean, and simple. I love that cake! I didn't have a cake- but my gown WAS an expression of the style of the whole wedding. This is such a beautiful cake. I had a gorgeous Vera Wang dress but I wasn't really into weddings when I got married (weird, right?). If I were to do it again I would definitely want a matching cake!!! Oh my, I could forgo the dress and just wear that cake:) It is amazing! all these 3 posts are so perfect with each other... i can only think how long it took to get that cake done... gorgeous!!! Wow, this is serious cake art!